Finding the right tone for your customer communications can be tough. A/B testing messages in Intercom lets you quickly see what messages increase engagement and conversion. What follows is a guest post from Ben Crouch, director of engagement at BCSocial, a a team collaboration tool which uses Intercom to connect with its customers. Here’s three ways BCSocial have used Intercom to find their voice and enhance their service. Being a young company growing up fast is like being a teenager – minus the spots of course! Growing into your personality and culture is just as important as the features and capabilities you develop in your product. In the B2B space there’s a tension between your playful and informal internal culture, and the grown up image you want to project to ensure customers take you seriously. Being able to communicate with customers in a variety of personas, without altering the core language of the product, has been in invaluable for BCSocial as we settle into our long term communication style. Intercom has helped us through that process by giving us metrics on how customers react to a range of messages, written in very different language styles. 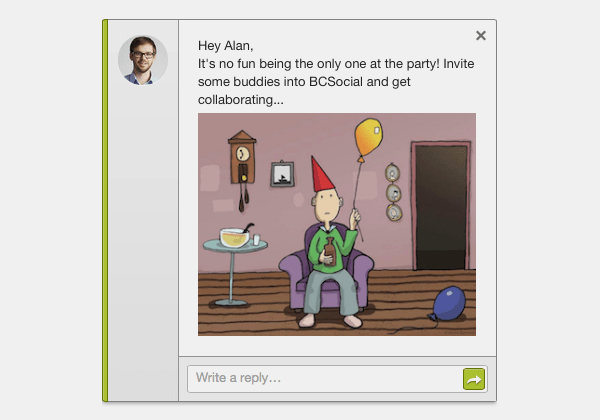 BCSocial is a product built around collaboration. Inviting additional users to the platform is a key step on the way to customers unlocking and understanding it’s value. The message below was targeted at users who had returned to the platform but still not invited anyone to collaborate with. It was intentionally quite playful, and broke the mould of the standard, formal language within the product. This communication yielded the highest response rate of any message that BCSocial has sent through Intercom. It has also given us the confidence to soften the language we use throughout the product. By using Intercom we were able to test our hypothesis – that customers would respond to a less formal style of communication – before we started any development work on the product itself. Intercom’s ability to track sessions, users, activity, along with product specific statistics, lets us see the impact of automated messages like the one above. Good developers will often have strong opinions about the inception and launch of new features and will soon get bored of implementing ideas they didn’t agree with in the first place. You typically only get a few shots at implementing a dud before you start to lose hearts and minds. The ability to test ideas and theories outside of standard development cycles is a great way to validate an idea and set it as a solid foundation for a successful product enhancement. Rather than building costly prototypes Intercom lets us get real feedback from relevant customers before we even begin designing or developing. That ensures we can challenge our own assumptions and change direction, if necessary, at a much earlier stage. We get to help our customers while also finding out where we need to improve the product or think about adding new features. At BC Social I’m responsible for getting users on-board and engaged with our product as quickly as possible. “Onboarding” can be an ambiguous phrase, which is used to cover off a range of activities depending on who you talk to. Expectations of what onboarding should cover range from transforming users’ working practices to the details of how to highlight a subtle feature. For me onboarding is about users discovering the value they were promised before they started using the product. 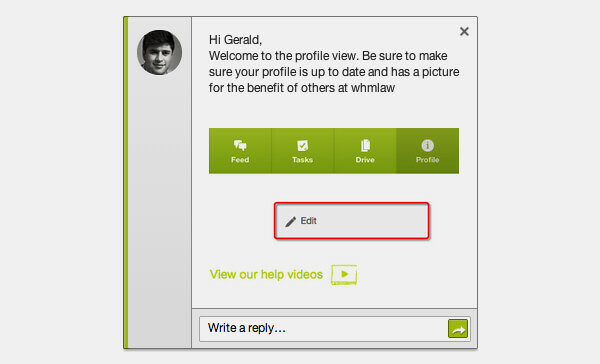 Onboarding is the bridge between your proposition and your features. I’ve sat in many long meetings where we’ve debated whether we should have endless arrows pointing out certain features or should we drop people into the parts of the product we believe will get them most excited. For me this is all time that could be spent testing ideas and concepts rather than talking about them. Intercom lets me to do that. We recently ran a campaign aimed at consultants, highlighting our ability to help them get control of document sprawl and better leverage the IP across their business. When a new customer signed up off the back of that campaign, we sent the users very specific messages, pushing them towards our powerful document features which greatly improved the relevancy of our offering to their needs. This resulted in a 25% increase in customers proactively reaching out to us to assist them through the conversion process. While the most common use cases of Intercom we were aware of before signing up were around communication, perfecting our wording, testing our hypotheses and improving on-boarding have proven to be extremely valuable to BC Social. Director of Engagement at BCSocial, Ben Crouch is responsible for the journey users take from legacy tools such as email and file servers, into the more open and effective world of social collaboration. To see more of BCSocial, and open yourself up to a working space without boundaries click here.